Jerry Kline (right), realtor, Keller Williams Flagship of Maryland, appears with multi-transaction clients Matt & Gail. 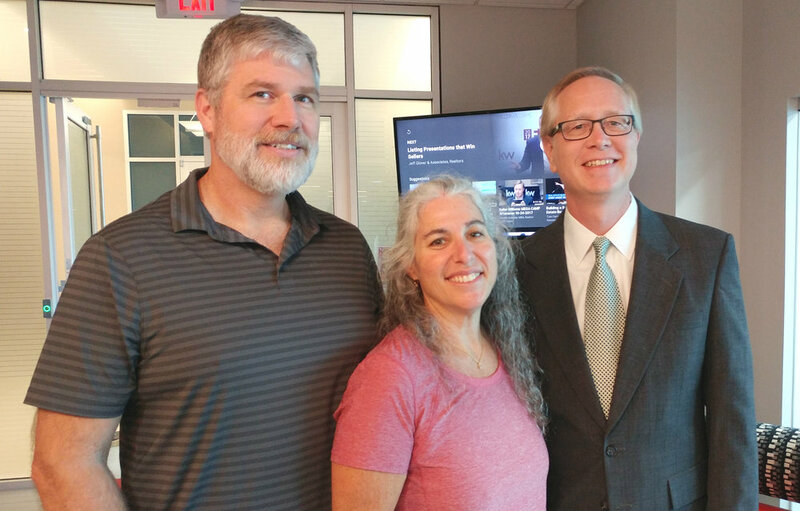 Jerry recently helped Matt & Gail sell their long-time home in Bowie, Maryland, and purchase a new home in the pastoral Anne Arundel County community of Davidsonville. Matt J. was exploring the back roads of Davidsonville on his motorcycle one day last spring when he suddenly started thinking about what it would be like to live there. Characterized by large, wooded lots, winding, two-lane roads and dozens of pastoral horse farms, Davidsonville is a place that draws people who seek a quieter, slower way of life. So, Matt & his wife, Gail, decided to make a change. They contacted Jerry Kline, realtor, Keller Williams Flagship of Maryland, to help them sell their Bowie home and purchase a new property in Davidsonville’s Harbor Hills community. Both transactions recently closed. The series of transactions was particularly complex because the purchase of Matt’s new home was done as part of a corporate relocation, which added several other parties and layers of paperwork to the project. “Jerry kept track of everything that needed to be done to make both our home purchase and sale as smooth as possible,” Matt said. “He reached out to us without delay when appropriate and was always quick to respond when we reached out to him. He will be our first choice if/when we move again." Congratulations on your new home purchase, Matt & Gail! Davidsonville is a wonderful community, and we’re sure you’re going to love living there! If you know someone who needs to buy or sell a home in the greater Baltimore/Annapolis/Washington, D.C. area, contact Jerry Kline of Keller Williams Flagship (443-924-7418) today.